If you are looking to play online casino in Europe then EU Casino online can be a best place for you. EU Casino uses casino software like NetEnt, Cryptologic (WagerLogic), SkillOnNet, WMS (Williams Interactive) and NextGen Gaming and offers hundreds of best online slots to its players. Players of most of the European countries including Finland, Sweden and United Kingdom can play their most favourite casino games here at EU Casino. The casino was launched back in 2009 and the owner of this great casino site is Skill On Net Limited, a leading company in iGaming business. EU Casino is licensed by Malta Gaming Authority and UK Gambling Commission. EU Casino provides best of the slots to the players. EU casino offers many depositing as well as withdrawal options to plays. Some of the deposit options are MasterCard, Neteller, Paysafe Card, Postepay, Ukash, WireCard, ewire, Visa, Entropay, Przelewy24, iDEAL, while ome of the withdrawal options are Cheque, ClickandBuy, Neteller, Visa, Skrill, Bank Wire Transfer, EcoPayz, Entropay, EPS, ewire, GiroPay, iDEAL, MasterCard, Moneta.ru, Nordea and PayPal. You can instantly play all EU casino slot games at your mobile or desktop. EU Casino accepts a variety of international currencies such that Australian dollars, Canadian dollars, Norwegian kroner, British pounds sterling, Russian rubles, Swedish kronor, US dollars, Denmark kroner, South African Rand and Swiss francs. The main languages of EU Casino are Arabic, Bulgarian, Croatian, Czech, Danish, Finnish, German, Hungarian, Italian, Norwegian, Polish, Portuguese, Spanish, Swedish, French, Greek, Romanian, Russian, Turkish and Slovenian. Though, EU casino is one of the best online casino of Europe and UK, It does not accepts players from some countries like Australia, Belgium, Cyprus, Denmark, France, Hungary, Israel, Mexico, Romania, Spain, Turkey, United States, Italy. If you choose to play at EUCasino, You would receive 100% to up to 100 Free spins. 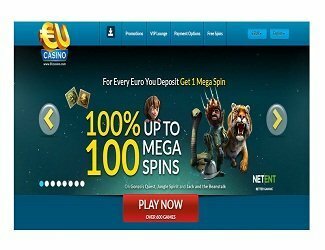 For every euro you deposit at Eucasino, you would get 1 free mega Spin for free as welcome bonus. EU Casino is a hub of online casino games. Whether you are looking to play online slots, video poker, Roulette or any other sorts of table games, EU casino is always there for you. You would find over 600+ of best online slots and table games here at EU casino. EU casino also offers card games, live casino and Jackpot to its worldwide players. Some of most popular video slots available here at EU casino are Wizard of Oz- Road to Emerald City, Fairytale Legends: Hansel And Gretel, Monopoly Bring The House Down, Zeus God of Thunder, Terminator 2, Mega Moolah, Thunderstruck, Thunderstruck II, Medusa, Rainbow Riches PicknMix, Guns N’ Roses, Wild Crystal Arrows Hot Slot, Bruce Lee and Hot Wheel. EU Casino offers many card games like American Blackjack, European Blackjack, Progressive Blackjack, casino war, Caribbean Poker, casino Hold’em, Baccarat, Craps, let Them Ride, American Blackjack Rurbo and progressive Blackjack Turbo. Aces and Faces 10 hands, Aces and Faces 25 Hands, Deuces Wild, Deuces Wild 10 hands, Deuces wild 25 hands, Jacks or Better 10 hands, jacks o better 25 hands, Joker Poker 10 hands and Joker Poker 25 hands are available at EU Casino. Live Dealer Baccarat, Live Dealer Roulette and Live Dealer Blackjack are available Live casinos at EU casino. EU casino also offers huge jackpot games to players. Some of them are Arabian Nights, Cash Splash, Fruit Fiesta, Fun Fair Ride, King Cashalot, Lots a Loot, Major Millions, Mega Fortune, MegaJoker, Mega Moolah, Mega Moolah Isis, Millionaire Genie, Tunzamunni, Wow Pot and Divine Fortune. All online slots available at EU casino can be played using mobile and smart phones. The casino is compitable with Android, Mac and all other operating systems. In order to play mobile games, no download the required. EUCasino has a very good turnaround time for Customer Support. A Player can contact them using live chat option or by sending them an e-mail to different e-mail addresses or by using their telephone numbers. You will get prompt reply from the executives of EU casino. They are highly compatible and are very caring in nature. No player would like to sign-up to an online casino site which is not safe. EUCasino is 100% safe & Secure and it keeps all your personal as well as financial data encrypted. They use latest SSL encryption certificates for their site. You don’t need to worry about anything related to EUCasino. So why you should play at EUcasino? The first benefit of playing online casino at EUCasino is that it operates in multiple launguages and accepts multiple currencies. The casino is compitable with desktop as well as with mobile phones. 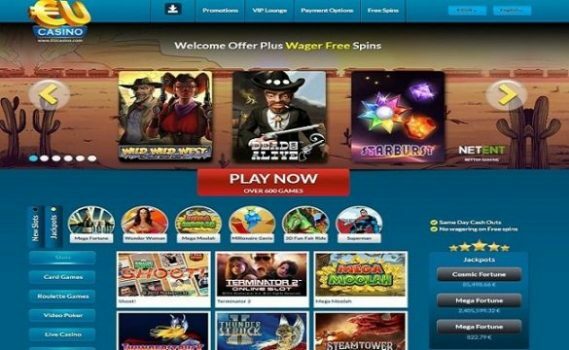 The site contains hundreds of slot games and table games. The site is secured with SSL Encryption.